In a large skillet, heat 1 tablespoon of the oil until shimmering. Add the Rice Krispies and togarashi and cook over high heat, stirring, until browned, about 30 seconds. Season with salt. Transfer to a plate and wipe out the skillet. In a small bowl, combine the fish sauce, water, sugar, rice vinegar, lime juice, garlic and chile and stir until the sugar is dissolved. Add the cilantro and mint. Add the remaining 1 tablespoon of oil to the skillet and heat until nearly smoking. 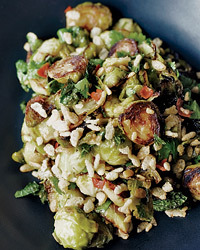 Add the brussels sprouts; cook over high heat, stirring, until charred in spots and heated through, about 5 minutes. It’s been said that the key to this creation is to almost burn the brussels sprouts. The charring along with the sauce makes these really delectable. Transfer to a bowl and toss with the vinaigrette. Just before serving, sprinkle the Rice Krispies on top and serve immediately. Note: Togarashi, a Japanese blend of chiles and sesame, is available at Asian markets.